The time consumers spend on a Web site doesn't always determine their order value at checkout -- but it will translate into a longer, stronger relationship between brands and consumers, especially during the holiday season. Research suggests that Amazon has become the magnet destination for online shoppers, commanding more than a 30% share of total time spent on shopping sites as consumers discovered and researched products. Big-box, traditional retailers managed to take attention online during the Black Friday weekend from smaller merchants, but could not make inroads into Amazon's share. Social and content play an important role too. The analysis conducted from Nov. 3 through Dec. 1, from Kantar Media, Millward Brown Digital, and Unmetric analyzes television advertising, social engagement, and share of time spent on a brand's ecommerce site. The report analyzes data from 13 retailers: Amazon; and big-box, brick-and-mortar stores Walmart, Target, Kmart, JC Penney, Kohls, Macy's, Sears, Home Depot, Lowes, Best Buy, Toys 'R Us, and Old Navy. The key metric -- share of attention -- reports the amount of time that panelists spent on an individual retail site as a proportion of their total time spent on the sample of 128 shopping sites analyzed in the report. The metric, based on daily activity, can roll up to multiple days and enables direct comparisons between Web sites. It reflects how consumers allocate their online shopping time, not their wallets, per the study, but the numbers show how time can influence how much and where consumers spend. Amazon.com captured the overwhelming share of attention from online shoppers prior to Thanksgiving Day. The company's average daily share took nearly 30% from Nov. 3 through Nov. 26. Providing some perspective, Walmart.com trailed with 3.73%, respectively. The combined Web sites of the traditional brick-and-mortar retailers, including Walmart.com, had about a 13% share of time spent. Walmart, Best Buy and Target led the list. While not mentioned in the report, the data also suggests consumers do their research first on Amazon by discovering and searching for information for products before they buy. Amazon was the most prolific publisher of social content, but its heavy focus on product-specific deals did not resonate as strongly with its site visitors as some of the softer and more entertaining content from the top engagement department store brands, per Jon Swallen, chief research officer at Kantar Media. Kohls emerged as a savvy user of social media, with a strategy that led to high levels of consumer engagement. In fact, Home Depot, Kohls and Macy's stood out. In aggregate, all retailers analyzed published more than 3,600 pieces of content on their Facebook pages and Twitter accounts. Volumes rose sharply during the last week, which included Black Friday and Cyber Monday, accounting for 40% of total postings. On Facebook, quality of content becomes more effective, compared with Twitter where quantity trumps quality. The influence of Black Friday and Cyber Monday on digital shopping behavior is evident when looking at the day-by-day results starting with Thanksgiving Day. Many people took advantage of the holiday to browse store Web sites, whether to make online purchases, research in-store Black Friday deals or otherwise plan their weekend shopping. Compared to the pre-Thanksgiving benchmark, Amazon's share of attention dipped 7% on Thanksgiving Day, while other retailers saw increases of more than 100% from their smaller bases. "On Black Friday the pattern changed. Amazon rebounded to a level above its pre-Thanksgiving baseline. Most of the competitor's sites declined from Thanksgiving Day but still landed well above their pre-holiday benchmarks, wrote Jon Swallen, chief research officer at Kantar Media, in the report. "Saturday and Sunday (Nov 29-30) saw further attention gains for Amazon and further erosion at competitors as consumers took stock of the unpurchased items on their shopping lists and updated their plans." 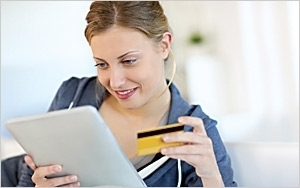 "Woman Shopping Online" photo from Shutterstock.